Duke Nukem 2 was delisted on Steam and GOG.com on December 31st, 2015. 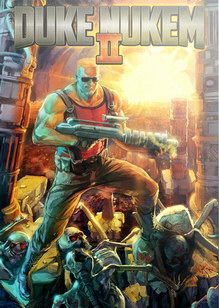 On GOG.com it was included in a bundle with Duke Nukem 1 and 2. The game on Desura was rendered delisted no later than October 25th, 2016 when OneClick purchased the site and took it offline. “Our hero is ready for action. Duke must escape his alien prison cell, then battle to end the hideous plans of the Rigelatins. I’ll Be Back Absent from Duke Nukem II’s original release, Duke has been retrofitted with sun glasses for a third dimension of coolness in a two-dimensional world. Damn… I’m Lookin’ Good! : Powered by 1993’s state-of-the-art, you’ll-think-you’re-actually-there cutting-edge technology, Duke Nukem II features vivid, lifelike, parallaxing graphics and speaker-breaking digitized sound effects.